Â Anton Barbeau has been Sacramento's resident pop genius since the late '80s, and there just seems to be no stopping him some 20 years into his prolific career. Anton has been blessed with that rare gift for being able to compose melodies that sound like theyâ€™ve always been with us. If songs like â€œOctagon,â€ â€œLeave It With Me, Iâ€™m Always Gentle,â€ and â€œCreepy Trayâ€ donâ€™t end up lodged in your brain after a few spins, then catchy Beatlesque pop clearly isnâ€™t your cup of tea. I get the feeling that even a few of Antonâ€™s heroes like Paul McCartney and Andy Partridge would be singing along with those and many others should they be lucky enough to encounter them at some point during their lives. Granted, an unfiltered talent like Antonâ€™s should be expected to be a little erratic at times. Itâ€™s surprising how a musician who can be so crafty at writing such perfectly enjoyable songs can rarely put together an album without tacking on a meandering track at the end. His live performances tend to ramble on as well with stream-of-consciousness monologues that donâ€™t always connect with his audiences, but catch him on a good night with the right crowd and youâ€™re sure to have a few good laughs while keeping your toes tapping along to his tunes. Any of the following CDs listed below will guarantee a pretty good time, although The Horseâ€™s Tongue is currently out of print, and The Golden Boot was haphazardly thrown together rather than given the special attention deserving of the tracks contained within. 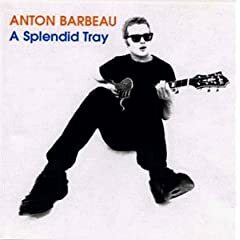 A Splendid Tray, which features â€œThe Banana Songâ€ (Antonâ€™s personal favorite and a highlight of his live shows), would be a good place to start. You can find Anton Barbeau's A Splendid Tray for sale here.